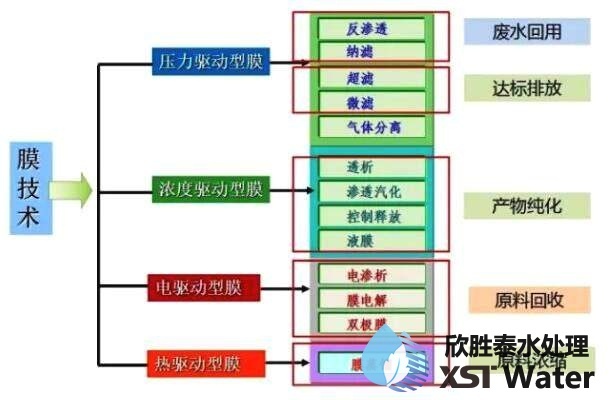 Analysis of common sewage treatment technologies - Xi'an Xinshengtai Water Treatment Technology Co., Ltd.
Membrane separation methods commonly used are microfiltration, nanofiltration, ultrafiltration and reverse osmosis. Since membrane technology does not introduce other impurities during the treatment, separation of macromolecules and small molecular substances can be achieved, and thus it is often used for the recovery of various macromolecular materials. For example, a polyvinyl alcohol slurry for printing and dyeing wastewater is recovered by using ultrafiltration technology. At present, the main difficulty in limiting the application of membrane technology engineering is the high cost of the membrane, short life, vulnerability to contamination and fouling. With the development of membrane production technology, membrane technology will be more and more used in the field of wastewater treatment. The iron-carbon microelectrolysis method is a good process for treating waste water by using the reaction principle of the Fe/C primary battery, and is also called internal electrolysis method and iron filing method. The iron-carbon micro-electrolysis method is the combined effect of electrochemical redox, electrochemical electric on the enrichment of flocs, condensation of electrochemical reaction products, adsorption of new flocs and bed filtration. It is a redox and electro-agglomeration and agglomeration. When iron filings are immersed in waste water containing a large amount of electrolyte, numerous tiny primary batteries are formed. After coke is added to the iron filings, the iron filings are in contact with the coke particles to further form a large primary battery, so that the iron filings are subjected to corrosion by the micro-primary battery. On the other hand, it is corroded by the battery of the original, which accelerates the progress of the electrochemical reaction. The method has many advantages such as wide application range, good treatment effect, long service life, low cost and convenient operation and maintenance, and uses waste iron scrap as raw material, and does not need to consume power resources, and has the meaning of “treating waste by waste”. At present, iron-carbon microelectrolysis technology has been widely used in printing and dyeing, pesticide/pharmaceutical, heavy metal, petrochemical and oil separation wastewater and landfill leachate treatment, and achieved good results. A typical Fenton reagent is a Fe2+ catalyzed decomposition of H2O2 to produce ̇OH, which initiates an oxidative degradation reaction of organic matter. Due to the long time required for the Fenton process to treat wastewater, the amount of reagents used is large, and excess Fe2+ will increase the COD in the treated wastewater and cause secondary pollution. In recent years, people have introduced ultraviolet light, visible light and the like into the Fenton system, and studied the use of other transition metals instead of Fe2+. These methods can significantly enhance the oxidative degradation ability of Fenton reagent for organic substances, reduce the amount of Fenton reagent, and reduce the processing cost. Fenton reaction. Fenton method has mild reaction conditions, simple equipment and wide application range. It can be used as a separate treatment technology or combined with other methods, such as coagulation sedimentation method, activated carbon method, biological treatment method, etc. Pretreatment or advanced treatment of degraded organic wastewater. Ozone is a strong oxidant. It reacts quickly with reduced pollutants. It is easy to use and does not cause secondary pollution. It can be used for disinfection, decolorization, deodorization, removal of organic matter and reduction of COD. The ozone oxidation method alone has high cost, high treatment cost, and selective oxidation reaction, and has poor oxidation effect on some halogenated hydrocarbons and pesticides. To this end, in recent years, related combination technologies aimed at improving the efficiency of ozone oxidation have been developed, in which a combination of UV/O3, H2O2/O3, UV/H2O2/O3 can not only increase the oxidation rate and efficiency, but also oxidize ozone alone. Organic matter that is difficult to oxidatively degrade. Ozone has a low solubility in water, and ozone generation efficiency is low, and energy consumption is large. Therefore, increasing the solubility of ozone in water, increasing the utilization rate of ozone, and developing an ozone generating device with high efficiency and low energy consumption have become the main research directions. Magnetic separation technology is a new type of water treatment technology that has been developed in recent years to utilize magnetic separation of impurity particles in wastewater. For non-magnetic or weakly magnetic particles in water, they can be made magnetic by magnetic inoculation techniques. The separation device is a disk magnetic separator and a high gradient magnetic filter. At present, magnetic separation technology is still in the laboratory research stage and cannot be applied to practical engineering practice. Low-temperature plasma water treatment technology, including high-pressure pulse discharge plasma water treatment technology and glow discharge plasma water treatment technology, is to use a discharge to directly generate plasma in an aqueous solution, or to introduce active particles in a gas discharge plasma into water, It can completely oxidize and decompose pollutants in water. Direct pulse discharge in aqueous solution can be operated at normal temperature and pressure. In the whole discharge process, in situ chemical oxidative species can be used to oxidize and degrade organic matter in aqueous solution without adding catalyst. This technology is economical and effective for the treatment of low concentration organic matter. . In addition, the reactor form using the pulse discharge plasma water treatment technology can be flexibly adjusted, the operation process is simple, and the corresponding maintenance cost is also low. Limited by the discharge equipment, the energy utilization rate of the process for degrading organic matter is low, and the application of plasma technology in water treatment is still in the research and development stage. Electrochemical (catalytic) oxidation technology directly degrades organic matter by anodic reaction, or generates an organic oxidant such as hydroxyl radical (̇OH) or ozone by anodic reaction. Electrochemical (catalytic) oxidation involves two-dimensional and three-dimensional electrode systems. Due to the micro-electric field electrolysis of the three-dimensional electrode system, it is currently highly regarded. The three-dimensional electrode is filled with granular or other debris-like working electrode material between the electrodes of the conventional two-dimensional electrolytic cell, and the surface of the loaded material is charged to become the third pole, and an electrochemical reaction can occur on the surface of the working electrode material. Compared with the two-dimensional plate electrode, the three-dimensional electrode has a large specific surface, which can increase the face-to-body ratio of the electrolytic cell, and can provide a large current intensity at a lower current density, a small particle spacing, a high mass transfer rate, and a spatiotemporal conversion. High efficiency, so the current efficiency is high and the treatment effect is good. The three-dimensional electrode can be used for treating domestic sewage, refractory organic wastewater such as pesticides, dyes, pharmaceuticals, phenol-containing wastewater, metal ions, landfill leachate, and the like. Since the 1970s, with the development of large cobalt sources and electron accelerator technology, the radiation source problem in the application of radiation technology has gradually improved. The use of radiation technology to treat pollutants in wastewater has attracted the attention and attention of all countries. Compared with traditional chemical oxidation, the radiation technology can be used to treat pollutants without adding or adding a small amount of chemical reagents, without secondary pollution, and has the advantages of high degradation efficiency, fast reaction speed and complete degradation of pollutants. Moreover, when ionizing radiation is used in combination with catalytic oxidation means such as oxygen or ozone, a “synergistic effect” is produced. Therefore, radiation technology to treat pollutants is a clean, sustainable technology, and is listed by the IAEA as the main research direction for the peaceful use of atomic energy in the 21st century. Photochemical catalytic oxidation technology is developed on the basis of photochemical oxidation. Compared with photochemical methods, it has stronger oxidizing ability and can completely degrade organic pollutants. Photochemical catalytic oxidation is photochemical degradation under the condition of a catalyst, and the oxidant generates a radical having a strong oxidizing ability under the irradiation of light. The catalysts are TiO2, ZnO, WO3, CdS, ZnS, SnO2 and Fe3O4. It is divided into two types: homogeneous and heterogeneous. The homogeneous photocatalytic degradation is based on Fe2+ or Fe3+ and H2O2. The photo-assisted-Fenton reaction produces hydroxyl radicals to degrade the pollutants. Heterogeneous catalytic degradation is A certain amount of photosensitive semiconductor materials, such as TiO2, ZnO, etc., are combined in the pollution system, and combined with optical radiation, the photosensitive semiconductor is excited by light to generate electron-hole pairs, dissolved oxygen and water molecules adsorbed on the semiconductor. Electron-hole interaction produces radicals with strong oxidizing power such as ̇OH. TiO2 photocatalytic oxidation technology has obvious advantages in oxidative degradation of organic pollutants in water, especially refractory organic pollutants. SCWO uses supercritical water as a medium to homogeneously oxidize and decompose organic matter. The organic pollutants can be decomposed into small inorganic molecules such as CO2 and H2O in a short time, and the sulfur, phosphorus and nitrogen atoms are converted into sulfate, phosphate, nitrate and nitrite ions or nitrogen, respectively. The United States has listed the SCWO Act as the most promising waste treatment technology in the energy and environmental fields. SCWO has a fast reaction rate and short residence time; high oxidation efficiency, most organic matter treatment rate can reach more than 99%; simple reactor structure, small equipment volume; wide treatment range, not only can be used for various toxic substances, but also water treatment technology An important means. It can also be used to decompose organic compounds; it does not require external heating, and the treatment cost is low; the selectivity is good. By adjusting the temperature and pressure, the physicochemical properties such as water density, viscosity and diffusion coefficient can be changed, thereby changing its solubility to organic matter. To achieve the purpose of selectively controlling the reaction product.